Polysiane After-Sun Fresh Jelly soothes, calms, and moisturizes the skin after sun exposure. 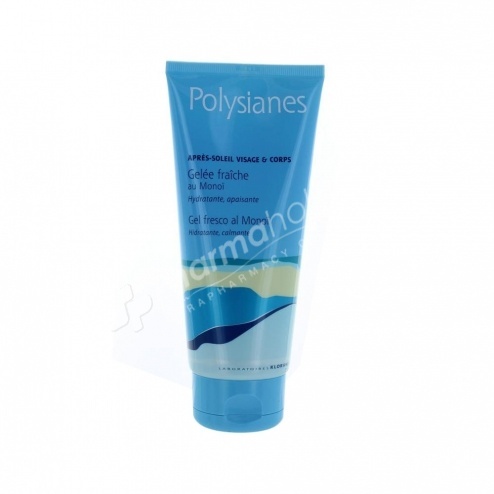 Polysiane After-Sun Fresh Jelly soothes, calms and moisturizes the skin after sun exposure. Enriched with Monoi and Morinda, this fresh jelly preserves the skin from drying out and helps maintain a bright and regular tan for longer. Apply on the face and body after sun exposure. Water (Aqua), Glycerin, Alcohol, Butylene Glycol, Cyclopentasiloxane, Peg-8, Hydroxyethyl Acrylate / Sodium Acryloyldimethyl Taurate Copolymer, Cyclohexasiloxane, Squalane, Methyl Gluceth-20, 1-2 Hexanediol, Batyl Alcohol, Benzyl Salicylate, Blue 1 (CI 42090), Caprylyl Glycol, Cinnamyl Alcohol, Citronellol, Cocos Nucifera (Coconut) Oil, Dimethicone Crosspolymer, Dimethiconol, Disodium Edta, Fragrance (Fragrance), Gardenia Tahitensis Flower, Hexyl Cinnamal, Hydroxycitronellal, Limonene, Linalool, Morinda Citrifolia Fruit Extract, Polysorbate 60, Propylene Glycol, Sodium Hydroxide, Sorbitan Isostearate, Tocopherol, Tocopheryl Acetate.